Home Articles Quick Tips, Guides & DMV Basics What Is a Bill of Sale? Are you familiar with invoices? Surely you’re familiar with receipts. Well, think of a bill of sale as a combination of an invoice and a receipt. Not only does it act as a record of the transaction, but also it includes all the specifics of the goods. Some states require bill of sale forms for title transfers and vehicle registrations; some don’t. Still, anyone who buys or sells a vehicle needs a bill of sale – even if only for their own records. Bills of sale are most common in the private used car market. For example, if you’re selling your used car to your neighbor or your kid’s kindergarten teacher, you’ll use a bill of sale. You’ll keep a copy for your records, and she’ll keep a copy to show when it’s time to transfer the car title and register the vehicle in her name. On the other hand, dealerships usually handle all that paperwork for people who buy new or used vehicles from their lots. 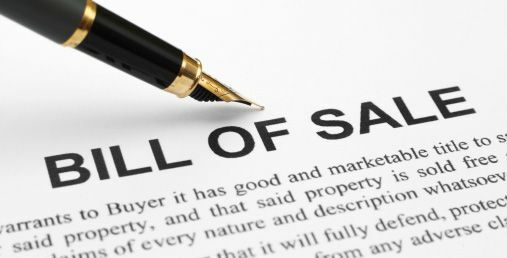 What Does a Bill of Sale Actually DO? Shows proof the original owner sold the vehicle to the new owner. Provides a record of the vehicle’s sale price and date. Helps the DMV calculate fees. NOTE: Some motor vehicle agencies use the information on the back of the title to complete title transfers, rather than a formal bill of sale. You can still complete a bill of sale for your records. How Do I Complete a Bill of Sale? Seller information like name, address, phone number, driver’s license number, and signature. Buyer information like name, address, phone number, driver’s license number, and signature. The vehicle’s make, model, year, and Vehicle Identification Number (VIN). The vehicle’s sale date and price. Generally, the seller keeps his copy for his own records and the buyer brings her copy to the DMV or other state motor vehicle agency that handles title transfers. NOTE: Be sure to check with your agency in advance, though: Some might require the buyer and seller to sign this form – and the car title – in front of an agent. Where Can I Find a Bill of Sale? Online through our Bill of Sale page. On your DMV’s Web site. Because some states have their own bill of sale forms they prefer residents to use, check with your DMV first (whether online or in person). If your state has no such preference (or even requirement), you can check with third-party providers for a generic copy to show the DMV or just keep on file.